This extension provides Physics behavior, which gives a realistic behavior to the object. You can choose if the object must be considered as a rectangle or a circle, if it's static ( In which case, it will be immovable ), if it can rotate and if it must be considered as a bullet. You can also setup the mass density. The mass of the object will be computed using its size and this density. The friction is used when two object are colliding : If this value is low, the objects will slide on each other. Linear damping affects the deceleration of the object : Deceleration is faster when this value is high. If set to 0, the object won't stop as long as it does not collide with another object. Angular damping is the equivalent for the rotation. 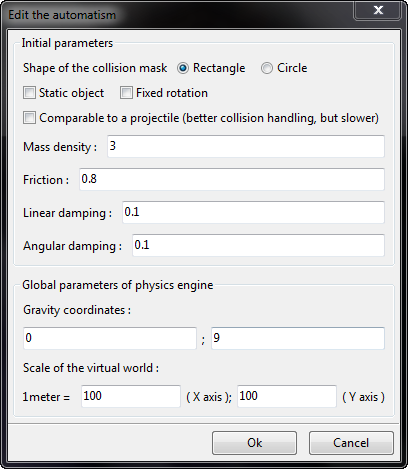 The gravity vector will affect all dynamics objects. The scale of the virtual world is the ratio between one pixel displayed in scenes and one meter in the physics engine. The physics engine is tuned for objects between one and 10 meters. Thus, if your objects' sizes are between 100 and 300 pixels, they will be seen as objects between 1 and 3 meters. But if your objects' sizes are between 1000 and 3000 pixels, you have to change the scale to set, for example, 1 meter = 1000 pixels on X and Y axis. Otherwise, you will suffer from a poor-quality simulation.